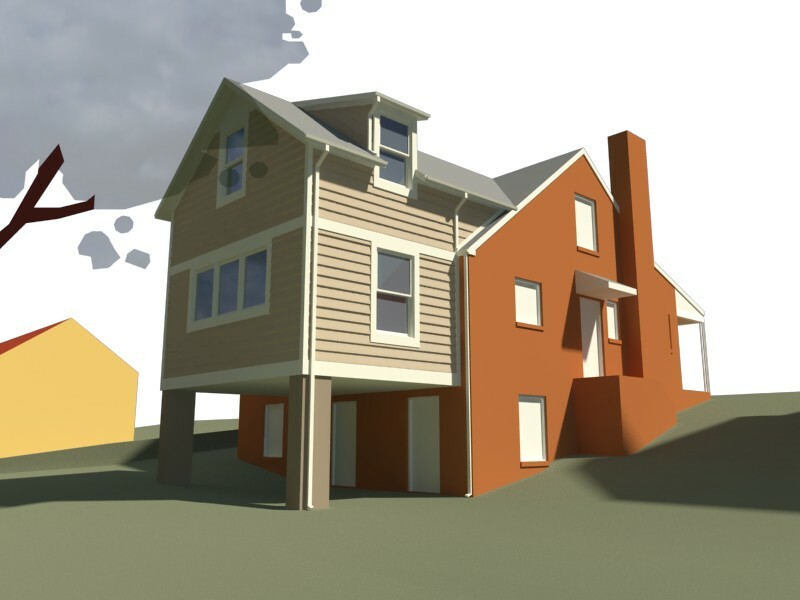 Orban Design – Page 18 – Providing the highest quality architectural rendering for Charlottesville and beyond. One of the things I’ve been working on in my spare time has been designing a kitchen addition to my house. I thought I’d post on this since I have a few projects cued up but can’t post images yet. This is something my wife and I have been discussing pretty much since we bought our house. Our kitchen currently is 8ft by 12ft and there is just not enough counter space, …really! We’ve gone through a whole variety of iterations on the kitchen design, but the latest round of design has been to get something drawn up that could be built for a reasonable budget. It’s a great time to build, so it would be great to get something going soon. The kitchen addition is planned at 12ft by 17ft, and the gable above it gives us enough space for an extra bedroom upstairs. The design is dictated by the footprint and the height of the existing house. One thing I am considering now that I didn’t need to before is that the city just enacted a new historic district review over our neighborhood. Now any new plans will have to be approved by the BAR (Board of Architectural Review.) This is adding another level of restraint to our planning, since my wife already nixed the more modern options I had in mind! Here is a view from the back looking at the current design of the addition. There are many cool features of the particular rendering software that I use. One of these that I’ll explain in this post is rendering with a global material. What this does is allow me to produce a rendering that is basically a white box, where I can see the effects of my lighting without the “interference” of multiple colors/ values/ reflectivity/ textures of the materials in a particular model. I’ll use the example of my previous post about ies lighting. 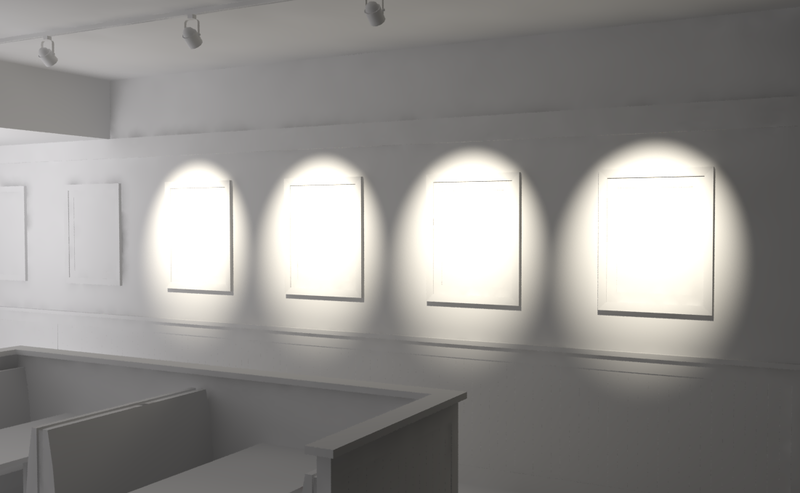 I showed the final image of the spotlights on the wall, but to get an even better idea of how the lighting works in the space, I can run a render with a global material. Here is a sample of the same view, but with a global color set to white. Hope everyone has a safe and happy holidays. Best wishes for the new year! 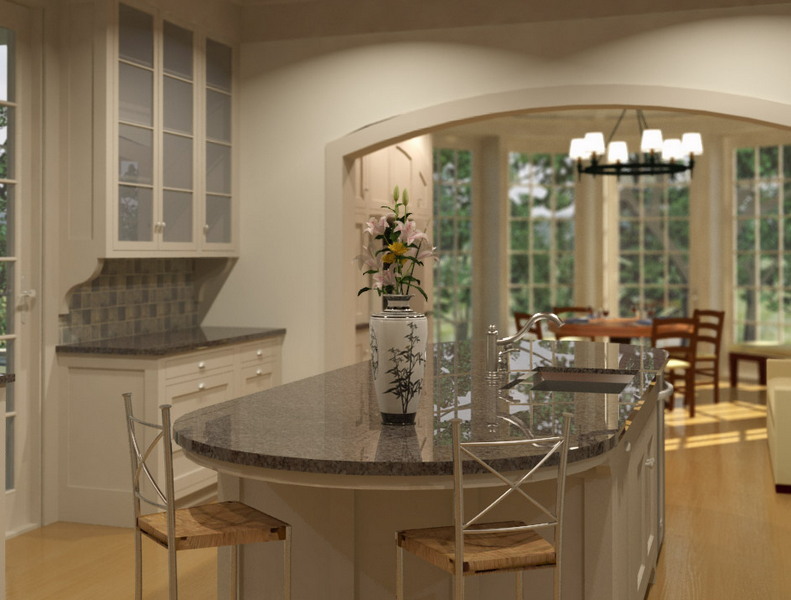 Here is a current rendering I just completed. 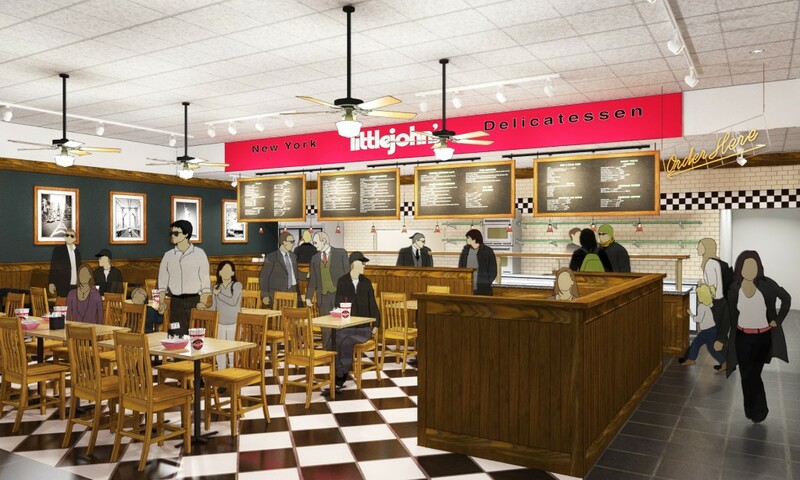 This is a view of a proposed restaurant interior for littleJohn’s. They are now offering franchising opportunities, and I had the opportunity to provide a rendering of their new look! One of my current favorite methods of enhancing the photo-realism of a rendering is by using depth of field (DOF) blur. With my interest in photography, I like to find the ways I can blur the line (so to speak!) between a computer generated image and a photograph. When a computer rendering is generated, it produces an infinite depth of field – everything is perfectly in focus, near and far. On the other hand with a camera, the lens’ aperture mimics human vision in permitting the camera to only have accurate focus within a specific range of distance, also known as the depth of field. The result is blurriness further away from the object that is in focus. Good: speed – it’s faster to render, as the rendering software doesn’t have to also calculate the DOF. Good: I can control the blurriness in Photoshop without having to render the image again. Bad: reflections are not blurred, nor are objects through glass. And without further ado, here are two versions of DOF blur – one focusing on the fireplace, and the other focusing on near objects. As you can see, DOF can be very useful to direct the eye towards a focal point, or emphasize certain elements of an image. The first image blurs the foreground to highlight the stone fireplace. The second downplays the chimney in favor of a more photographic style where the detailed foreground is given more weight. This second approach helps give the room a sense of depth as the side walls and fireplace recede into the distance. Used judiciously, (and once the other elements of the rendering have been accounted for – lighting, materials, contrast, etc. ), depth of field can be one more tool to bring a rendering to life.